Peter Venkman is an Ideas and Ghostbusters minifigure released in 2014. Peter Venkman wears a brick yellow Ghostbusters uniform, with unprinted legs and a printed torso. On the torso of the minifigure is a belt strap, a nametag with the initials "P.V. ", and straps for the Proton Pack that the minifigure wears. The minifigure has light brown hair and a light nougat head with a smiling expression on the front, and a scared expression on the back. The minifigure's Proton Pack is black with a dark red stud at its handle. Peter appears very similar to his previous variant, though has a several differences. 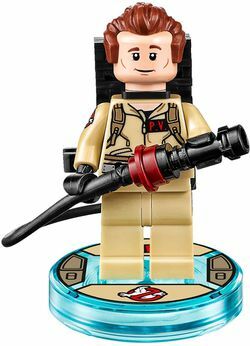 This variant has printing on the arms of the minifigure, with the left arm depicting the Ghostbusters emblem and the right having a pocket. Along with the arms, the minifigure has a different hairpiece, being a light brown version of The Doctor's hairpiece. This version of the character has the same hairpiece, arms, and legs as the Dimensions Variant. The minfigure has a new light nougat head with a confused expression on the front and a slime-covered disgusted expression on the back. The torso of the figure is the same as the previous variants, but lime green slime is draped across the front of it. This page was last edited on 6 February 2016, at 01:03.